That’s one mission of The Philanthropy Connection, which has a waiting list of would-be members. 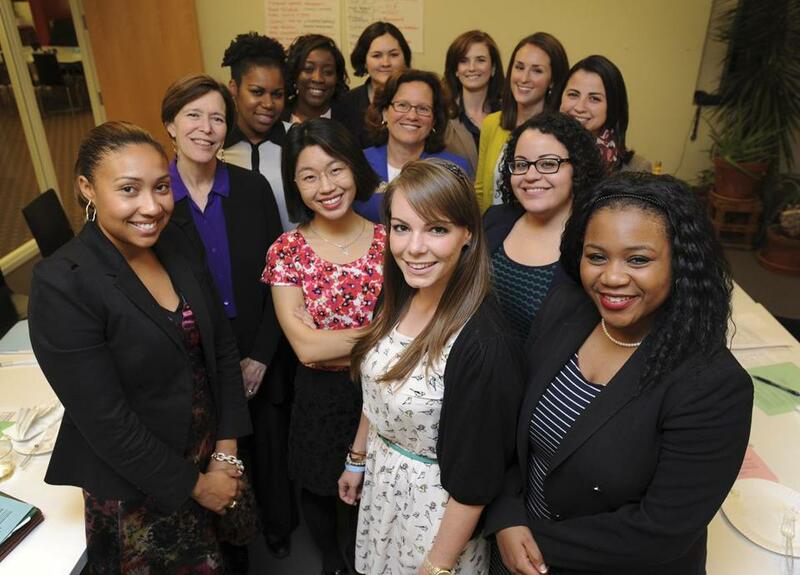 One facet of The Philanthropy Connection, founded by Marla Felcher (center, in blue jacket), is the Young Philanthropist committee, a fellowship program for women younger than 35. Give and ye shall receive. That could be the unofficial mantra of a new Boston-based charity that not only empowers women to take on the role of philanthropists but also equips them with the skills and connections they need to serve on the boards of the organizations they’re helping to fund. Swiping that simple premise, she returned to Boston and enlisted the help of two friends, Dharma E. Cortes, a grants expert, and Suzanne Carter, a retired commercial banker. Within seven weeks, they had enticed more than a hundred like-minded women to open their wallets. Compelled to pony up? Get in line. With 231 supporters in its sophomore year (including high-profile restaurateurs Jody Adams and Joanne Chang) and an 80 percent re-enrollment rate, membership is closed until 2015. That may be because membership not only has a price tag, it also has its privileges. Much of the appeal is reflected in the Philanthropy Connection’s credo: Give. Receive. Learn. “We want to give [women] the skills to be a good board member,” Felcher says. Or make that a better board member — the average member already serves on a board or two; of those who don’t, a number want to. Perhaps the best training ground the group offers is the chance for members to serve on a review team, learning to probe for a nonprofit’s weaknesses as well as its strengths. Interest is keen: Last year, 30 to 40 women reviewed applicants; this year, 96 have signed on for training. Throughout the year, the charity also hosts panel discussions and intimate educational seminars called The Philanthropy Dialogues. The most popular tutorial? “Stop Faking It,” which instructed members how to tear apart a nonprofit’s financial statements, or 990s. 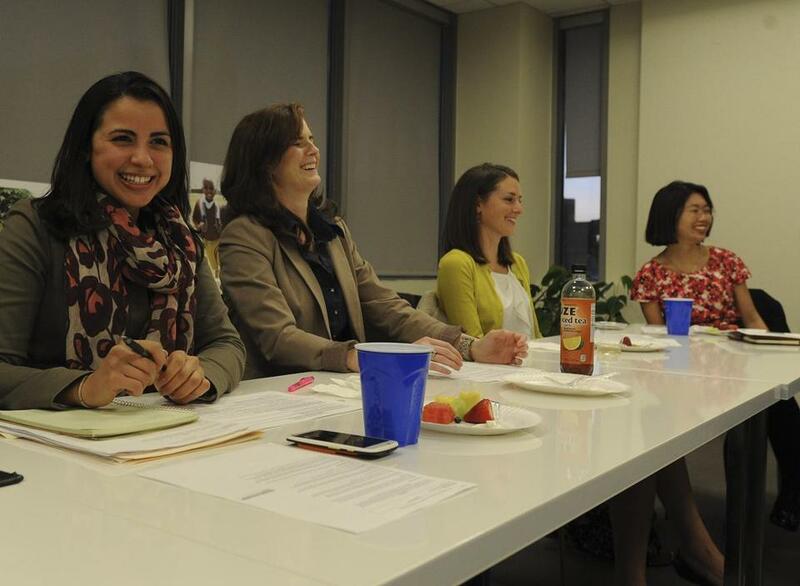 Amanda Miranda (from left), Kait Gilpin, Jesse Hatfield, and Jihye Choi take part in a Young Philanthropist committee meeting in Boston earlier this month. “We’re not only giving, we’re receiving a lot of knowledge,” says Sharhea Wade, 27, an assistant vice president at State Street Corp. and a group board member. She chairs the Young Philanthropist committee, a Philanthropy Connection fellowship program for women under 35 whose membership fee is funded by other group members, and she recently joined the leadership team of the National Black MBA Association’s Boston chapter. “Now we can pick up one of these reports and run through the numbers with more insight,” says Wade. Hard skills aside, Felcher believes that ultimately the best credential is truly “getting” an organization and its mission. “That’s when you become a really good board member — when you understand the challenges the clients are facing,” she says. Melissa Schorr is a Globe Magazine assistant editor. Send comments to melissa.schorr@globe.com. Correction: Because of a photographer’s error, Jihye Choi’s name was misspelled in a caption in an earlier version of this story.